Appropriately testing raw materials and having the correct expertise are essential whether the conversation is about the potential hazards of a given substance in the workplace, or assessing those hazards using Risk Assessments or tools like an SDS (Sales Data Sheet). Many times, the scope of work provided to an IH focuses mainly on compliance with respiratory and other OSHA driven hazards. What is sometimes forgotten is that there often are combustible dust hazards associated with those dusts. The relationship between an effective Risk Assessment (or a full blown Process Hazard Analysis, or PHA) and good sampling and testing techniques is a close one. Simply because a given dust falls beneath the EPA/OSHA requirements for the respirable dust fraction does not mean that the process or facility is adequately protected from combustible dust risks. Often, we are approached by companies looking to replace a dust collection system, and they ask for the Kst and Pmax values. These values are essential for designing the new collector and accompanying protection system, but they do not address potential ignition hazards elsewhere in the facility. Other tests, like the Minimum Ignition Energy (MIE) test and the Minimum Explosible Concentration (MEC) are helpful in guiding Environmental Health and Safety (EHS) and IH professionals to protect the entire process. 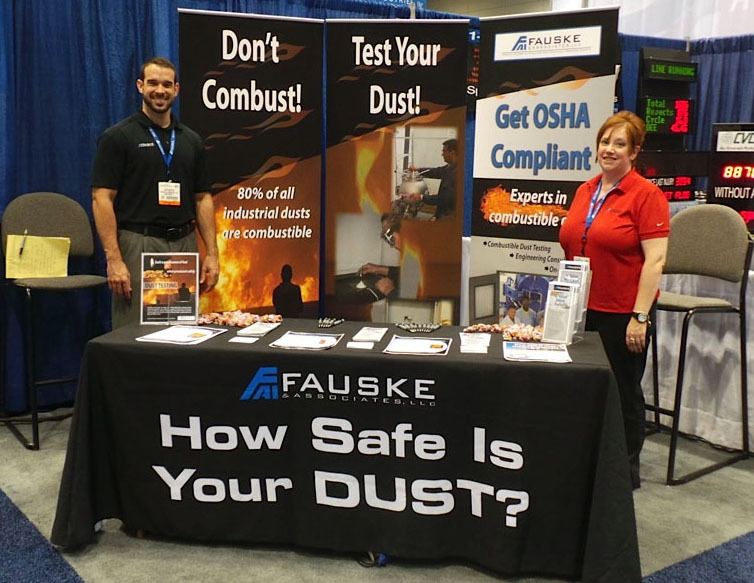 We are excited about the breadth of topics being presented at the AIHce conference – and we are here (Booth 3052) to talk with EHS and IH professionals about what it looks like to appropriately manage the hazards associated with combustible dust, with the changes in HAZCOM, and with conducting Risk Assessments at facilities where there are dusts, flammable gas, and reactive hazards.